Mushroom Model Publications (MMP) is a UK based company that has been around since 1996. Most modellers would be familiar with their work through their quarterly modelling magazine “Mushroom Model Magazine”. The reputation of good quality and content that this magazine has built up was taken one step further when MMP expanded their operations into publishing books. 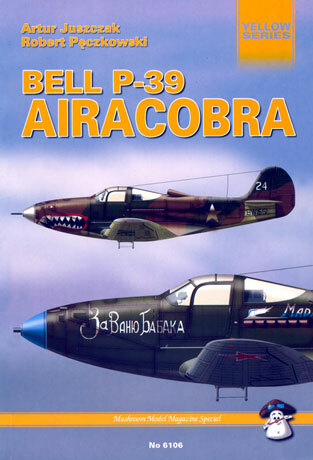 The Bell P-39 Airacobra is one of MMP’s newest releases in their Yellow Series and quite a comprehensive book it is. The text is sensibly laid out and easy to follow. Following an overview of the Airacobra’s development and operational use, it covers each and every version of the P-39 from the experimental YP-39 to the last of the line the P-39Q. Also included (where appropriate) in each of the models is a description of individual production blocks as well as a list of what serials belonged to what production block. Line drawings in 1/72 scale illustrate each of the sub-types. The book is liberally illustrated. Some of the period photos are a little blurry but where they have been used it seems they have only been included to illustrate a little known aspect of the Airacobra. An example of this is a photo of the rear fuselage of the P-19 camera installation in the rear fuselage of a 71st Tactical Reconnaissance P-39Q-5. Following the description of each type there are 46 pages bearing colour photographs of several different P-39s in a “walk around” type format that cover each part of the airframe. One of the aircraft is a Russian P-39Q that is preserved in a Finnish museum. The beauty of this machine is that it is unrestored and in totally original condition, hence it carries authentic colours and stencil data – a real boon if you are a stickler for detail. The final 12 pages are devoted colour profiles of P-39s (two to a page) bearing the colours and markings of the various services that operated them. Soviet use of the P-39 is recognised throughout the book and the re is a four-page section listing Soviet P-39 aces. The book has been printed in Poland. It is B5 in size-240x165 mm (the same size as the Osprey Aircraft of the Aces series) and comprises 128 pages printed on good quality glossy paper between cardboard covers. A good book and value for money. If you are contemplating building one of the Eduard or Monogram kits you will find it invaluable.